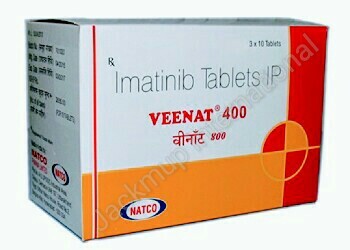 Description:- Veenat 400mg tablet is used in the treatment of chronic myeloid leukaemia (cml). In patients with cancer, a change in DNA (genetic material) triggers a signal which produces abnormal cancer cells. Veenat 400mg tablet blocks this signal, and thus stops the production of these cancer cells. Your doctor may ask you to undergo certain blood tests before and during treatment with imatinib, to check your response to the drug and the drug’s side-effects. Imatinib can cause dizziness or drowsiness and blurred vision, therefore, caution should be taken before operating an automobile or machinery or engaging in activities requiring mental alertness and coordination.